A girl supports Meat Free Mondays and is eating healthy this week because of two big events this upcoming weekend. 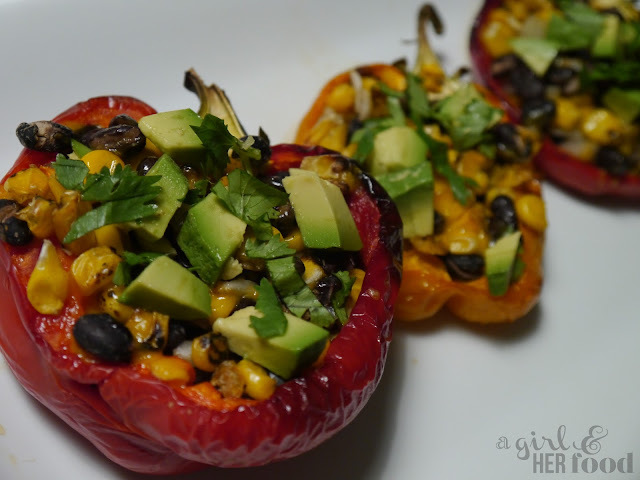 These stuffed peppers are easy to make and delicious. Trader Joe’s is the best place to get the ingredients and is very budget friendly. A girl didn’t add rice because it’s her least favorite ingredient and not so healthy for you. However, feel free to add rice and ground turkey or beef to this recipe. ½ teaspoon of homemade taco seasoning or Pilsen Latino Seasoning from THE SPICE HOUSE. Preheat oven to 400 degrees. 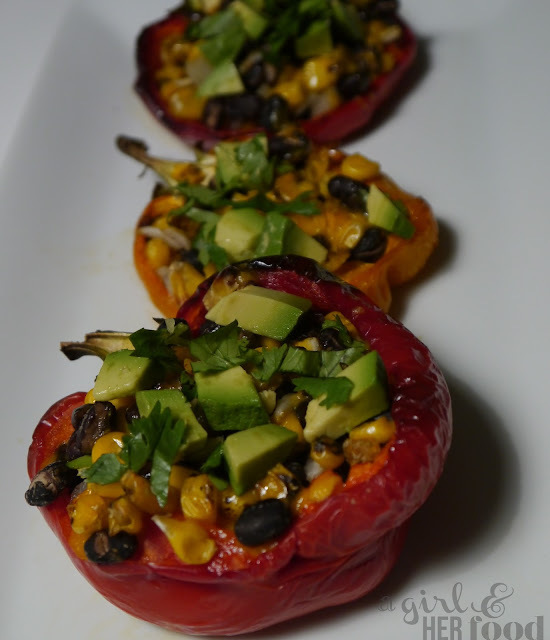 Place the bell peppers on a baking sheet or baking dish. Lightly coat the bell peppers with olive oil. Roast the bell pepper for about 20 minutes. While peppers are roasting, prep all other ingredients. In a bowl add onions, garlic, black beans, corn and seasoning. Mix ingredients evenly in bowl. Remove peppers and let them cool down to handle or use your oven mitt to stuff them. Spoon the mixture into the cored middle of the bell peppers. Place stuffed peppers back into the oven for another 10-15 minutes. Remove and lightly shred a little cheddar cheese and place back into oven until cheese is melted, about 1-2 minutes. Remove the stuffed peppers from oven and place your favorite toppings. A girl topped her pepper with cilantro, avocado and a squeeze of fresh lime. You can also add your favorite southwestern toppings like sour cream, hot sauce or salsa.